Thermal Signature	From 1 day & 1 night. Gift voucher: A gift voucher available on request: if you wish we will send you a gift voucher by post. Extra charge for single room. Meal plan: Full board: Health & Taste sensation nutrition with Vichy Célestins mineral water (ESPA 2014 culinary trophy). Care treatments à la carte: in addition to your weekend spa package, book some treatments à la carte (massages, beauty care treatments, dietetic consultation, behavioural therapy coaching, sports activities,...). Free access to the Vichy Thermal Spa relaxation area: all about the Thermal Spa Pass ! PRICE PER PERSON AVAILABLE FOR 2019. Best price guaranteed: 1 day & 1 night. From €281 per person per day. 3 treatments + Thermal Spa Pass + Deluxe Thermal Spa view room (2 people minimum) and Half board. Our prices include sales tax and exclude tourist tax (€2.50 per day and per person) and extra treatments and services, upon availabilities. Treaty yourself to a wellness break at a world-class thermal spa of 7 500 m2 connected to an elegant five-star hotel by an overhead walkway. Discover the benefits of Vichy spring water which originate from the Auvergne volcanoes, rich in mineral salts and oligo-elements! Experience one of the most beautiful Spa destinations in Europe (World Spa Awards 2013). 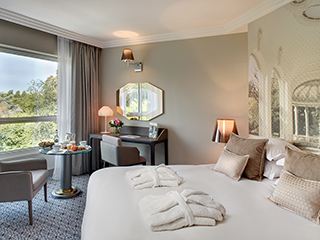 Be part of the peaceful and elegant atmosphere of the VICHY CÉLESTINS SPA HÔTEL. Enjoy the serenity of this all-inclusive weekend package!